In this post I illustrate how to accomplish this. 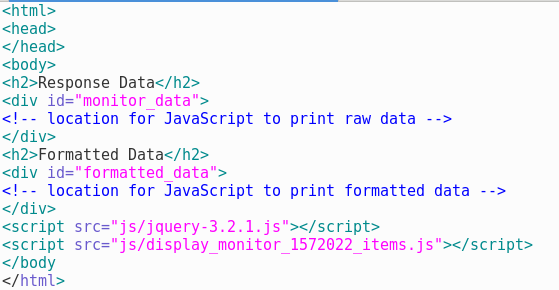 The variable resp contains the raw JSON response text, which is displayed beneath the Response Data HTML header, in the div element named monitor_data. But we want our users to be able to clearly see the specific information that enables them to accomplish their job requirements. In the example case, we make a variable meta_obj that encapsulates the meta portion of the API response text. This provides knowledge of the status of the last API monitor check (success or failure). The templates object is an array. In the example, there is only one template, so we can safely hard-code templates_obj in this case. Then, we append that HTML into the formatted_data div block.